If you are on your feet at work all day, the last thing you want is to feel pain in your feet. Unfortunately, those suffering from plantar fasciitis are often in pain all day long, especially if they don’t have the right footwear. You want to be able to focus on your hob—and not the pain you are feeling—and thankfully, there’s a solution! By purchasing a good pair of boots that are designed with someone who has plantar fasciitis in mind, you can be comfortable on your feet all day long! When you’re looking to purchase the best boots for plantar fasciitis, you need to know what to look for. Aside from determining a budget before you start your search, you should also look for boots that have great arch support and deep heel cups. In addition to good support, you also want to make sure the boots you select are also comfortable and fit you well. Something else to keep in mind is the traction that a boot offers, as well as its water resistance. Be sure that you select a boot for plantar fasciitis that meets your needs. So, now that you know a bit about what to look for in the best work boots for plantar fasciitis, where do you start the search process? With hundreds of brands and models on the market, it can be very overwhelming. Thankfully, we’ve done the work for you! After scouring stores and the web, we’ve come up with a short list of the 6 best work boots for plantar fasciitis. Grab a pair of these boots and we promise that your feet will thank you! If you are looking for a great pair of boots to wear with plantar fasciitis, the KEEN Utility Men’s Flint Mid Work Boot is a great option. These boots might not win any beauty contests, but they are extremely durable and can help you maintain comfort all day long. With waterproof nubuck leather uppers, you can rest assured that your feet will remain dry, while the non-marking rubber outsole is slip-resistant to keep you on your feet no matter the conditions. Plus, the KEEN Utility Men’s Flint Mid Work Boot is also F2413-11 I/75 C/75 and ASTM F2412-11 compliant. 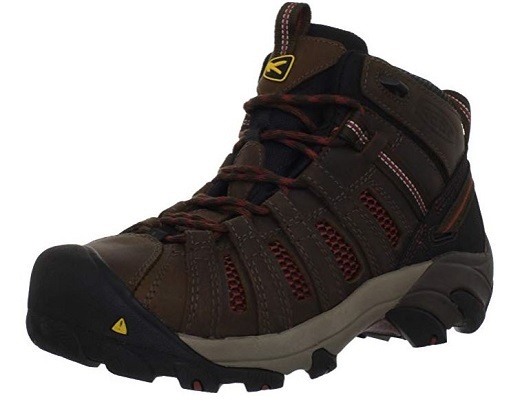 In addition to everything listed above, the KEEN Utility Men’s Flint Mid Work Boot is also very comfortable, with the ability to reduce pain and stress on your feet and joints. The lace-up style boots have an anatomically correct steel toe to keep you protected, and the contoured heel offers increased lockdown. Plus, the KEEN Utility Men’s Flint Mid Work Boot also has a removable, dual-density EVA footbed that offers the support and comfort you know. The molded EVA midsole also offers long-lasting support for even the longest shifts. If you want a quality and comfortable pair of work boots for plantar fasciitis, check out what the KEEN Utility Men’s Flint Mid Work Boot has to offer. 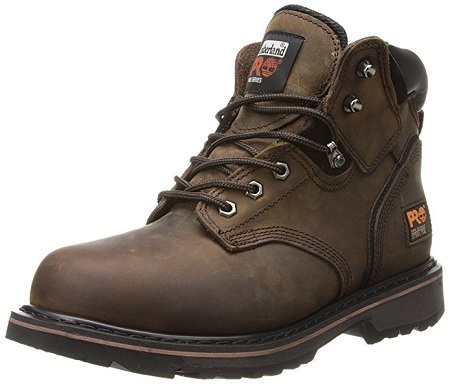 Another great option for anyone looking for a solid pair of work boots for plantar fasciitis is the Caterpillar Men’s 2nd Shift 6″ Plain Soft-Toe Work Boot. These boots come in a variety of colors with an oiled full grain leather and nubuck leather upper, so you can choose what meets your style preference, but no matter what color you choose you’ll get a great pair of boots. Not only do the Caterpillar Men’s 2nd Shift 6″ Plain Soft-Toe Work Boots look good, but they also feel good on your feet. With a Goodyear welt construction and a padded collar and tongue for added comfort, your feet have all they need to remain comfortable all day. In addition to everything listed above, the Caterpillar Men’s 2nd Shift 6″ Plain Soft-Toe Work Boot also has a slip, heat, oil, and abrasion resistant outsole. Plus, these soft toe boots have a nylon mesh lining for increased comfort and a steel shank that provides increased support and comfort that will keep plantar fasciitis pain at bay. The boots also have a Climasphere sock liner that wicks away moisture to keep your feet comfortable and dry while at work all day or night. 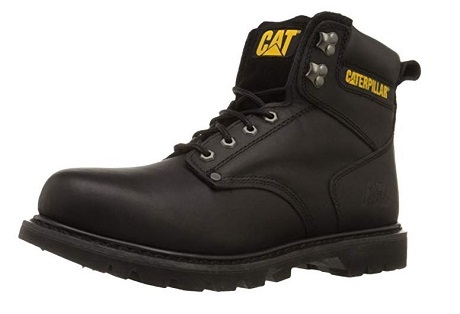 If you want the best work boots for plantar fasciitis, the Caterpillar Men’s 2nd Shift 6″ Plain Soft-Toe Work Boot should definitely be on your list to consider. 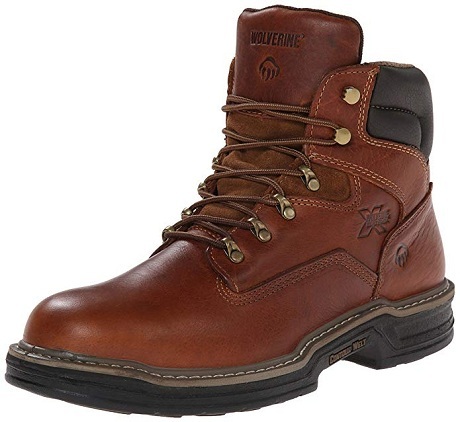 For good work boots for plantar fasciitis, the Wolverine Men’s W02421 Raider Boot should also be considered. Not only do these boots look good with their full grain leather and contrast stitched details, but they also have everything you need to keep plantar fasciitis pain at bay. With Multishox technology that features multiple compressed pads that absorb shock and impact where you need it most while providing essential bounce back to conserve energy, the Wolverine Men’s W02421 Raider Boot is certainly worth a second look. The MultiShox rubber lug outsole also provides a consistent grip no matter the surface you’re working or walking on, so you can rest assured that you’ll stay upright. As far as plantar fasciitis goes, the Wolverine Men’s W02421 Raider Boot has a lightweight PU midsole that offers both stability and support. There’s also a mesh lining and removable MultiShox cushioned footbed that cradles your foot every step of the way. In addition, the steel toe that is rated ASTM F2413-11 M I/75 C/75 EH will keep your toes safe from hazards. 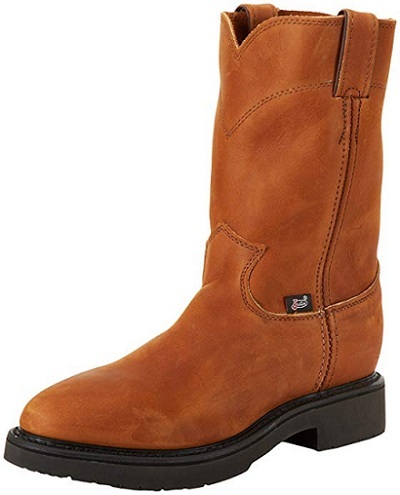 Plus, the Wolverine Men’s W02421 Raider Boot has a padded tongue and collar for enhanced comfort. During your search for the best work boots for plantar fasciitis, the Wolverine Men’s W02421 Raider Boot is certainly worth a look. A list of the best work boots for anything would never be complete without a pair of Timberlands on it. 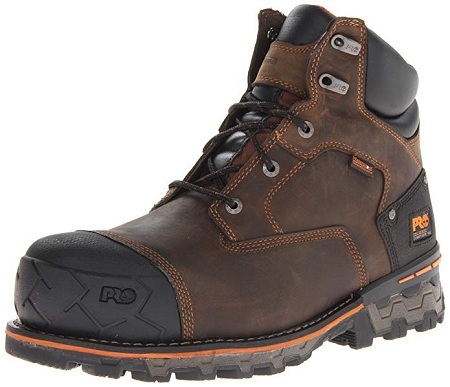 The Timberland PRO Men’s 6″ Pit Boss Steel-Toe boot is a great option, especially when it comes to plantar fasciitis. With the classic Timberland look—rugged nubuck leather upper and a secure lace-up design—the Timberland PRO Men’s 6″ Pit Boss Steel-Toe look good and will make your feet feel good. Coming in a variety of colors, what really makes these boots stand out is their wide array of features. With a padded collar and tongue and roomy toe box, they’re comfortable from the moment you slip them on. What makes the Timberland PRO Men’s 6″ Pit Boss Steel-Toe boot truly extraordinary is the PRO 24/7 Comfort Suspension designed to reduce foot fatigue while providing the arch support and cushioning you need for even the longest work shifts. The polyurethane footbed and fabric lining also feature antimicrobial treatment to help eliminate stinky odors. Plus, the lightweight nylon shock diffusion plate offers added structure and support to help those who suffer from plantar fasciitis. The Timberland PRO Men’s 6″ Pit Boss Steel-Toe boot is also rated to meet a large number of safety standards, so you can rest assured they’ll keep your safe and comfortable. For a top of the line pair of work boots for plantar fasciitis, check out everything the Timberland PRO Men’s 6″ Pit Boss Steel-Toe boot has to offer. 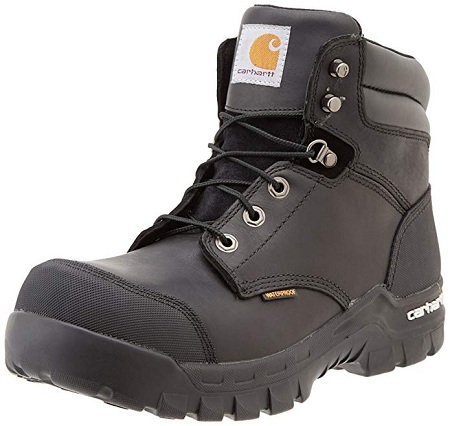 Another option for a good pair of work boots for those with plantar fasciitis is the Carhartt Men’s CMF6371 Work Boot. Carhartt is a brand name that stands for quality and durability and these boots are no exception. Coming in a sleek black design, these work boots are made from oil tanned leather. They also feature a waterproof membrane that is breathable while still maintaining the ability to keep your feet drier and more comfortable. The lace-up closure also has speed hooks to help you lace up even quicker. In addition to everything listed above, the Carhartt Men’s CMF6371 Work Boot also has all of the elements necessary to keep plantar fasciitis pain away. With a dual-density ortholite insole, your feet will be comfortable and supported all day long. There’s also an EVA midsole with a PU strobel pad for those interested in enhanced shock absorption. With a rugged flex outsole that offers great traction and a lightweight composite safety toe, the Carhartt Men’s CMF6371 Work Boot has all you need in a work boot. For those needing the best boots for plantar fasciitis, the Carhartt Men’s CMF6371 Work Boot delivers. When it comes to tactical boots, Bates is one of the top names in the game. Even better, the Bates Men’s Enforcer 5 Inch Nylon Leather Uniform Boot is perfect for someone that suffers from plantar fasciitis. That is because these boots have a fully cushioned removable insole with extra pads for shock absorption that combine to provide exemplary comfort and support. These boots also come with a padded collar for increased comfort, while the breathable mesh lining wicks away moisture to keep your feet dry. In addition to everything listed above, the Bates Men’s Enforcer 5 Inch Nylon Leather Uniform Boot is also extremely durable. With cement construction and contrast stitching detail, you can rest assured that these boots are built to last. The Enforcer Series Ultra-Lites rubber outsole is also rated to pass the SATRA WTM 144 test for slip resistance so you’ll easily be able to stay on your feet. Made from leather and ballistic nylon, these durable and comfortable work boots have everything you need! 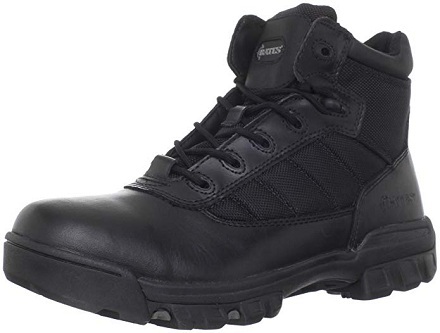 If you are looking for a top of the line pair of work boots to keep plantar fasciitis pains away, the Bates Men’s Enforcer 5 Inch Nylon Leather Uniform Boot should definitely be on your list to consider. Timberland is a world-renowned brand that always gets it right as far as manufacturing high-quality footwear is concerned. The Timberland PRO Men’s Rigmaster Steel is a good example of what this brand has to offer. Made of 100% waterproof leather, the Rigmaster promises to keep your feet dry and comfortable, no matter the weather. The boot comes with anti-slip, oil-resistant outsoles for enhanced durability and resilience when strutting on any kind of surface. This feature is particularly important for people with plantar fasciitis as the shoe protects the affected heel from getting worse. Moreover, the outsoles consist of ladder locks that provide extra safety when scaling up a ladder or a sloppy area. Amazingly, this shoe also features an anti-fatigue steel toe with added cushioning in the foot bed for added protection and extra comfort when nursing an inflamed heel. The shaft measures about 7.75 inches from the arch while the heel measures 1.5 inches. The platform is only 1 inch high, providing the much-needed support, balance and stability when in motion. With a quick release lacing system, you can easily take off your shoes whenever you start feeling uncomfortable or the pain becomes unbearable. 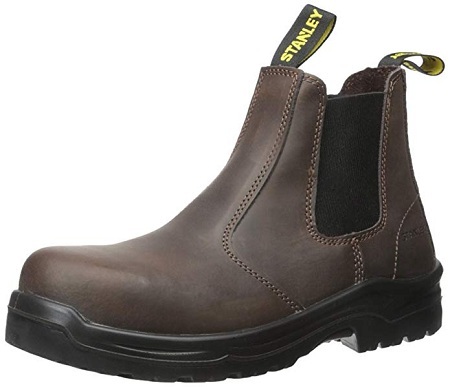 The Stanley Men’s Dredge Work Boot might be of great interest to those who love laceless slip-on boots. Made of 100% full grain leather, the boot is elegant, comfortable and ideal for harsh working conditions thanks to its tough design. Moreover, it comes with synthetic anti-skid soles that can navigate through any type of terrain with relative ease, without harming your heel. Unlike traditional boots that are often sweaty and poorly ventilated, this pair of work boots consists of moisture-wicking lining that keeps your feet dry throughout the day, regardless of the weather conditions. What is more amazing is that the boot comes with a removable EVA insole that consists of an additional EVA cavity for exceptional cushioning and extra comfort. Furthermore, it has a TPU toe cap and heel counters that provide reinforced protection against knocks. The boots also feature steel shanks that offer sufficient support between the outsoles and insoles. These shanks effectively diminish the weight on your feet and calves when scaling rough terrains, hence preventing grievous harm to your heel ligaments. Wearing and taking off these shoes is very easy, as they feature pull-on loops and elastic side gores that easily adjust depending on the size of your feet. The shaft measures approximately 5.75 inches from the arch while the heel measures 1.75 inches. If you are looking for a pair of work boots that is tough yet exceptionally comfortable on your feet, consider acquiring the Timberland PRO Men’s Boondock Work Boot. This shoe is widely renowned for its comfort, durability and functionality in harsh work environments. The Boondock boot is made of 100 percent leather with a matte finish that makes it resistant to moisture and bacteria. It features a synthetic sole with a rugged, zigzag pattern to transverse all types of terrain and challenging work environments. Moreover, the outsoles are resistant to slipping, abrasion and oil as they are made of pure natural rubber. This boot also features a molded rubber toe that consists of a nonmetallic and nonmagnetic composite to protect your toes and feet from knocks and falling objects. Nevertheless, the highlight of this work boot is its anti-fatigue technology feature designed to guarantee optimum comfort by absorbing shock when strutting. Its safety features are unquestionable as the laces are well-waxed to reduce moisture and chemical damage, while the shoe uses composite to prevent electric charge. The only problem is that these boots are somehow heavy (each shoe weighs approximately 3 pounds). However, this is not a major issue considering the fact that the boots are intended for use at work rather than casual purposes. The Justin Original Work Boot might not be as popular as some of its competitors, but it offers a number of benefits that make it worth checking out. This handcrafted boot might be confused for casual shoes thanks to its elegant, stylish appeal. Nevertheless, do not be fooled by the soft aesthetics. 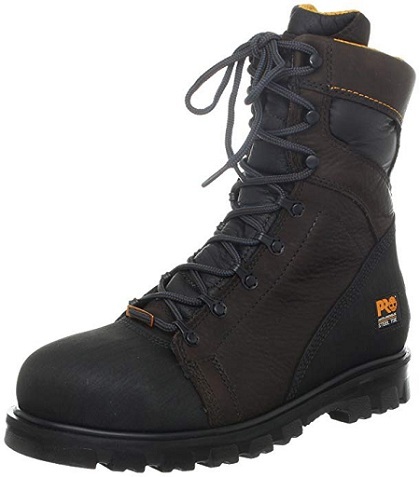 This boot offers superior functionality for challenging environments while remaining soft on your feet. Justin Original works with Orthotic Texon to deliver custom insoles that are exceptionally comfortable and resilient at the same time. The custom insole inserts provide optimum shock absorption and ample arch support through each stage of motion. Its 90 degree heel works effectively to stabilize heel cavities and protect your ligaments from injury. Wearing and taking off the boot is as easy as a breeze as the opening measures 13.5 inches. The shaft of this shoe measures 10 inches from the arch while the heel is 1.5 inches. The platform is relatively low, measuring 0.75 inches only. This provides sufficient arch support and proper balance. The outsoles are made of polyurethane that is resistant to abrasion, oil, gas and slipping. Furthermore, it is 100% non-metallic, making it non-conductive to electricity as it can endure up to 18,000 volts at 60 hertz per minute, protecting your soles and heels from accidental contact with electrical circuits.